The chief minister will establish his own committee to scrutinise gas bill charges faced by Isle of Man customers. Last month customers protested against what they described as a "flawed" pricing system from the island's only supplier. Manx Gas announced a "comprehensive" review after the government intervened. Chief minister Howard Quayle said: "I'm pleased they're reviewing their prices, but I want to ensure they receive an effective level of scrutiny". During his State of the Nation address he said he would set up his own committee alongside fellow Tynwald members. Manx Gas introduced their current banded pricing system in January 2016 with the lowest band being charged 16p a day and the highest £2.13 a day. Each customer is placed into a "consumption band" ranging from A, for those who used up to 5,000 kWh of gas a year, through to I, for those who use more than 50,000 kWh. But campaigners claim the system is "flawed and immoral," although Manx Gas said it would help spread costs over the year. Mr Quayle said: "As a monopoly supplier, Manx Gas is in a privileged position. 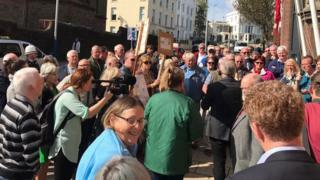 "In return for that privilege, they have a responsibility to ensure they are fair in the way they provide their service to the people of the Isle of Man. "It is a finely balanced relationship, but at the moment my instinct is that the balance is falling in their favour". Tthe Manx Gas review is scheduled for the first half of 2018.